There are so many ways to mix it up in the bedroom – and for the record, we’re talking about interior design. By injecting a few key objects with a healthy dose of creativity, you’ll never have to go to sleep in an uninspired space again. Unless you take a sleeper train or something. Anyway, the best place to start in jazzing up the bedroom is, of course, with the bed itself. It’s the centrepiece of the area and the one basic feature that a bedroom can’t get along without (the clue is in the name). The beds below all deviate a little bit from the norm in some way without being totally outlandish. Let’s call it understated eccentricity. 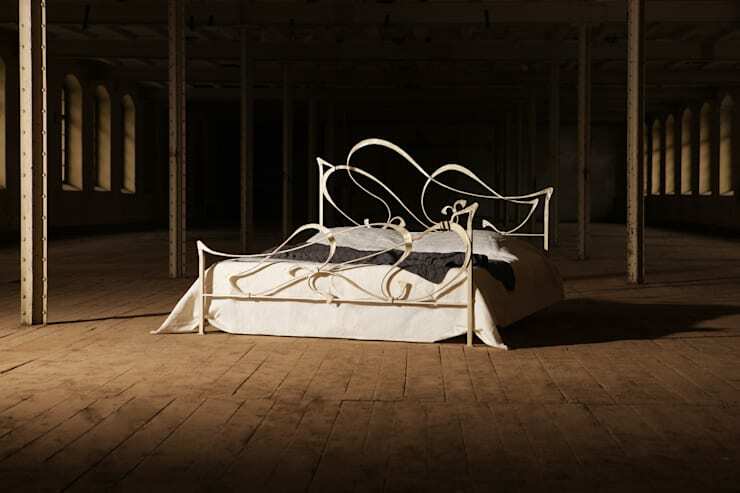 Looping and flowing wildly yet prettily, like someone’s exceptionally lovely handwriting, the metalwork of this bed seems liberated from conventional constraints such as symmetry. The white paint is ideally suited to a frame that seems so light and airy that it might take off without warning at any minute. It’s a piece of furniture that manages to convey femininity extremely effectively without recourse to flowers, pastels or other design clichés. These stackable beds are unusual, yes, but in a strictly practical way. They’d be of good use in a guest room, or perhaps in the room of a child who often has friends to stay. They have sensible, simple forms designed primarily to make lifting and separating the beds easy, and their structures are more appealing for this lack of complexity. Separated out, the beds looks just as neat and no-nonsense as they do when stacked together. 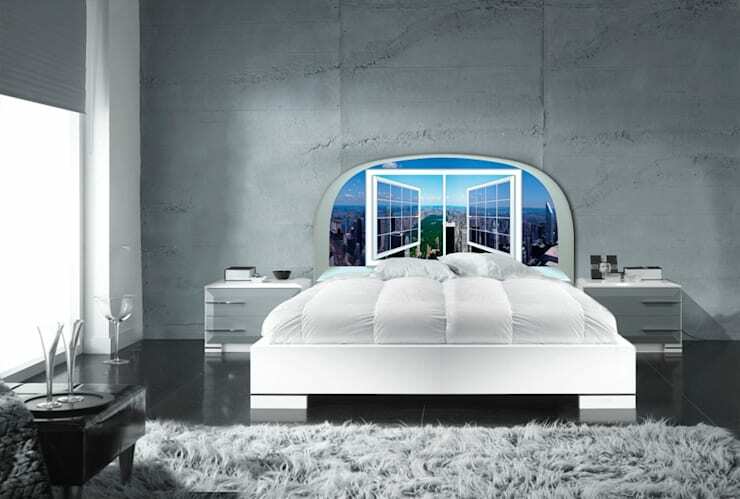 The design of this headboard, bizarrely, imitates an open window and a city view. It’s the sort of thing it’s possible to stare at for quite a long time before fully understanding what’s going on. The exclusive use of white and grey throughout the rest of the room’s décor, as well as the unpainted wall behind, draw the eye instantly to the colourful headboard. Now we come to another bed that is more notable for its headboard than for any other component. This time the headboard is soft and upholstered, which instantly creates a sense of luxury and comfort. 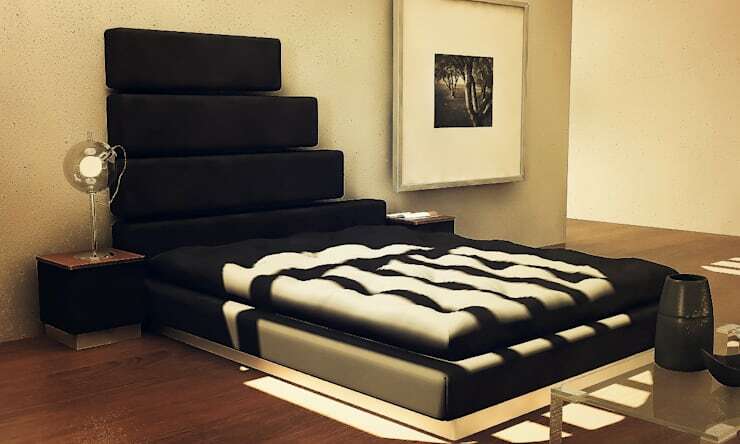 Where it differs from the decadent headboard you would find in most hotels, however, is in its asymmetric stair formation, which is idiosyncratic enough to render this bed unfit for the hospitality industry. Instead, it belongs in the bedroom of someone with a strong personal taste in contemporary design and a fondness for the slightly unexpected. Floating beds are increasingly popular, though as we can just about see if we look underneath the bed in this picture, they are in fact subject to the same boring laws of gravity as the rest of us. A bed like this looks great in a simple room such as this one, but the environment in which it would really shine would be in a truly stripped-back, uncompromisingly minimalist bedroom. You might want to get a white, black or grey one for that, though. “Unconventional” is perhaps not an entirely fair description of this bed. “Excessive” might in fact be more appropriate. This is a bed for those who revel in going all out; those for whom a silver headboard is insufficient when one could have a silver headboard that is also upholstered in red velvet, and those who come out in hives at the mere thought of bedding made of anything other than satin. One thing is clear: when purchasing this bed, it is absolutely essential to get the matching sofa too. If you’re going to do it, do it right. Which of these beds would you have in your home?